The study of the women's suffrage movement in the United States has generated a considerable amount of memoirs, biographies, and scholarly histories. Yet for all of their variety, most of them adopt a predominantly national focus, which can often obscure the efforts by activists at the state and local level to win for women the right to vote. This is just one reason why Sara Egge's book is such a welcome addition to the historiography of her subject. Focusing on three rural counties in the Midwest, she describes the emergence of the suffrage campaign in the region and the different direction it took in the different states in the region. For Egge, much of the context of the campaign was determined by the population trends within the region, which were shaped by two distinct groups of settlers: Yankee Protestants and immigrants from Germany and Scandinavia. Together they possessed certain assumptions about gender roles which defined a highly proscribed role for women in the public sphere. Yet as Egge shows, women soon used that ostensibly limited degree of involvement to argue for a far greater degree of involvement. Central to this was the participation of local women in the Women's Christian Temperance Union, which gave many women experience in public activism at the cost of alienating many immigrant voters. Though successive attempts to win for women the vote in the Midwestern states ended in frustration, the campaigns and arguments made in them helped lay the groundwork for their success at the end of the 1910s, when their long-argued case for their importance as citizens gained strength in an environment of progressivism charged by war. 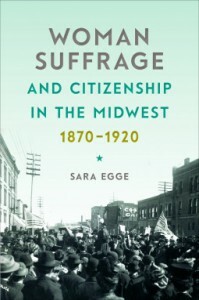 By focusing on suffrage campaigning at the local level, Egge brings long-overdue attention to a vital aspect of the suffrage effort. While lacking the drama and glamor of the national campaign, she underscores the degree to which such efforts were key to the eventual success of the suffrage campaign in America. That this book serves as a reminder of this fact is just one reason why it should be read, as it spotlights the vibrant civic lives in rural communities in the Gilded Age Midwest, in which women played a vital role. Reading Egge's book helps to underscore that women have long played an important role in the public sphere, one in which the granting of the right to vote was merely an overdue acknowledgement of that fact rather than an inauguration of it.